FLIP: You went from animator to sculptor - was this a transition, a continuation, or a completely new path for you? Vicki: I think that the new path of full time sculptor was really a transition from animation. Although Sculpture is 3D, I still employ many of the same skills I used in 2D animation. For example, my creatures are slightly anthropomorphic, my poses are kind of like in-betweens, and there are elements of humor and storytelling. The biggest difference is, I am a business owner with all the headaches as well as perks that accompany that role, and I'm the sole artistic decision maker. FLIP: Where did you learn to sculpt? Did or do you have a mentor? Vicki: California State University Northridge, where I went to college, had a small bronze foundry where I learned the basics of casting, and fell in love with the process. At that time, animation was my career of choice, but I tucked dreams of doing more sculpture away for "someday." In animation, I was lucky to have the amazing Benny Washam as my mentor and friend for many years. I can still hear his voice in my head when I'm sculpting, or doing any art for that matter. FLIP: What is your process for creating a sculpture? Vicki: I have so many ideas for things that would be fun to sculpt, but each time I'm going to do something new, one of those ideas starts pushing its way to the front. Once I make my decision, I'll visit the creature in person if possible, and watch videos to capture the physiology and movement. I do tons and tons of informational sketches until I feel I actually understand where I'm going with it. All of my pieces will eventually be bronze castings. I sculpt in wax, and use an armature only if I absolutely need it. When it's finished, I take it to a professional mold maker and, after that, to the foundry for casting. I do all the finish work, which includes metal chasing and patinas. Over the years I've developed a style where my creatures interact with found objects to tell a story. I generally don't make limited editions, because each piece is an original with its own unique design challenges. For example, I found a tractor seat. I thought this would be a good place to put a crow's nest. So I sculpted the baby crows in a nest, and made the nest to fit in the tractor seat. Then the babies looked lonely, so I made a momma bird. I had to make the momma bird's feet fit on top of the tractor seat. Then I felt it needed some height, so I searched around and decided on an old wooden beam I found in Maine. I mounted the tractor seat on it; then the post had to be mounted to a steel plate so the whole thing wouldn't tip over. The engineering is an organic process and can sometimes become quite complicated. FLIP: What kind of workspace do you have? Do you work alone? Vicki: I have two studios, one in Hollywood and one in Bath, Maine. My studio in Hollywood is so small, everything, and I mean EVERYTHING, is covered with wax. My kids joke that on a hot day our place is like the La Brea Tar Pits. However, in Maine I have a dedicated sculpting studio, a wax room, a welding room, and a full workshop. I mostly work alone, but I bounce ideas off my partner, animation visual development artist Paul Shardlow. He also helps me with the complicated engineering and heavy lifting (some of my pieces weigh over 200 lbs!). FLIP: Did you have to shop around to find a foundry you liked? There are good and bad castings as well as good and bad foundries. There can be air bubbles, lost parts (most castings are in several pieces that are welded together later), or a number of other technical things that can go wrong. There is also the time-frame in which the foundry does the casting. If the facility is very busy, takes an extended (unannounced) vacation, or equipment fails, it can really lengthen the time it takes to push a sculpture through the system. These problems can be quite nerve-wracking, especially if I have an up-coming show! 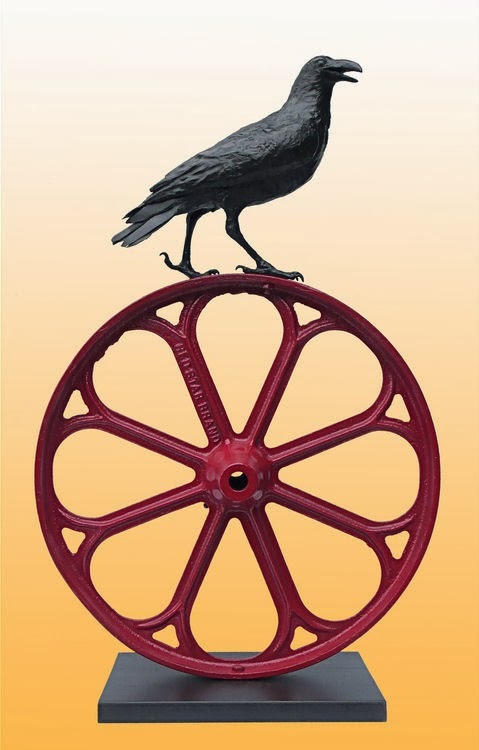 I'm happy to report, after some less than wonderful experiences, I have a great foundry in Santa Ana, Legacy Fine Arts, and in the same building, Del Sol Bronze. Both are very professional and care about their artists. They are SO good, I ship my waxes all the way from Maine to California and back again so they can do the casting. 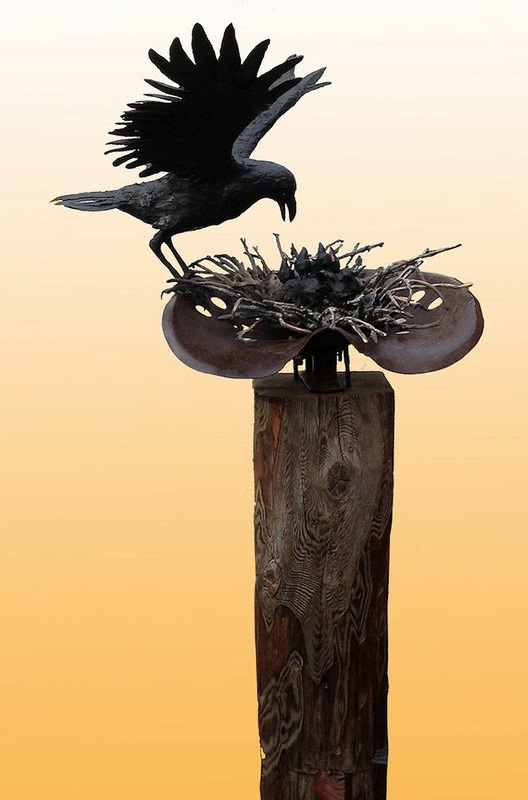 FLIP: You do a lot of bird sculptures, especially crows. Was this by design, or is there something there that has clicked with you? 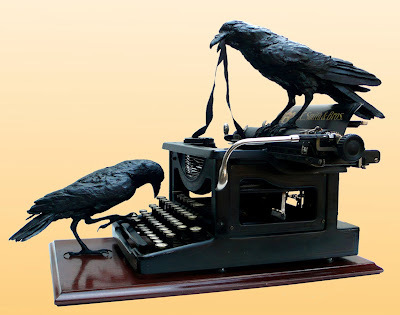 Vicki: Crows are gregarious, and you can have so much fun with them when they're interacting with recognizable objects and machines (like an antique typewriter). 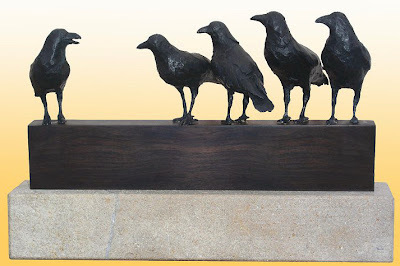 I never run out of things to do with them, and I'm always on the lookout for new "perches" to put them on. Although crows take up the most real estate in my inventory, my favorite birds are vultures. In fact, my website is http://vulturesculpture.com/ . Sometimes visitors to my booth assume that my love of vultures and corvids mean that I am drawn to the dark and moody, and often quote Edgar Allen Poe to me... But that’s not it at all. I find vultures fascinating and beautiful, and I am worried about their survival. As scavengers, they are a necessary part of a healthy ecosystem, but world-wide they're rapidly, dangerously being decimated by lead and other poisons. They are so much more than just birds that eat dead things. 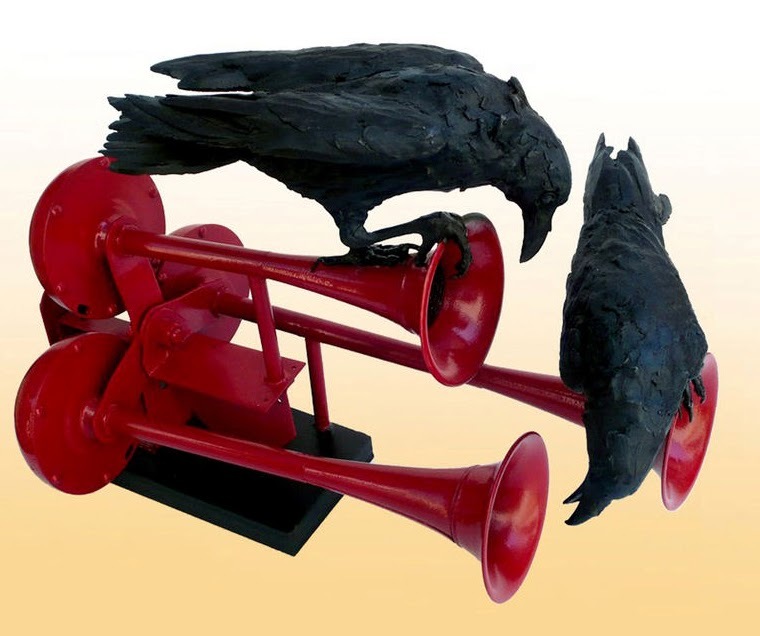 The thing I love about both crows and vultures is they are so entertaining! Have you ever watched a vulture run? Also, both make really graphic sculptures with striking silhouettes. I suppose that take on them comes from years working in animation. FLIP: What or who inspires you? Vicki: In terms of art that inspires me, it’s usually an isolated piece rather than an artist. For instance, in “She Goat”, Picasso used a giant palm frond to create her back and actual milk bottles for her udders. Brilliant! However, most often I’m inspired by the animals themselves, especially the ones with the biggest personalities. Strangely, those who catch my eye are frequently animals other people find ugly or unappealing. I didn't deliberately set out to make a collection of "faces only a mother could love" but I have to admit, it’s a thrill when a stranger remarks that they never realized how beautiful a vulture is! When I met Clarence the Cinereous Vulture at the San Diego Wild Animal Park, it was kind of like falling in love. I thought about him day and night - his gigantic feathers, his goofy gait, his wise old man face… He was really the start of my business, my first vulture! There are so many wonderful beasts out there for inspiration, but to choose it as a subject, I need to be passionate about each piece I do. The time and cost involved make it difficult to just whip out another sculpture. My large turkey vulture, Grace, took me six months from start to finish. FLIP: Where can we see/ purchase your artwork? Vicki: I can be contacted via my website http://vulturesculpture.com. I usually show at a dozen art festivals per year across the country. My show schedule and contact info are on the website. 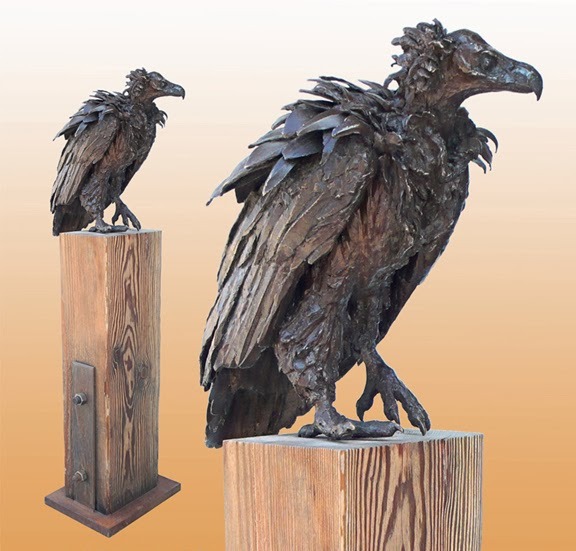 I also have a public sculpture in Ocean Springs, Mississippi, and there will soon be a life-sized harpy eagle installed at Zoo Miami Florida. FLIP: Ever miss the studio grind, or are you over it? Vicki: A part of me still misses flipping pages every once in a while, but that disappeared with the introduction of CG animation. This gave me the unexpected, but welcome opportunity to pursue that "someday" dream. It amuses me that frequently customers at a show will say "oh , your work is so animated!" I also miss the people and I still love animated films, but there's a lot to be said for making my own artistic decisions, and getting more recognition for the work I do. And collectors tell me how happy my sculptures make them!